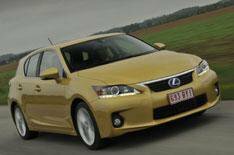 Lexus CT200h driven | What Car? Whats not to like a properly posh small car with serious green credentials and the reassurance of top-notch customer service? The new Lexus CT200h seems to have it all. Or does it? On paper, it promises so much: under the bonnet (and in the boot) youll find the same hybrid system as in the Toyota Prius a 1.8-litre petrol engine plus battery-powered electric motor, which equals low emissions and low tax bills. The car will run on petrol or battery power alone (the latter for only a kilometre or so) or a combination of both. The batteries are recharged using recaptured energy as you slow the car down. Brilliant. Youve also got the top-notch quality and unbeatable customer service that Lexus is famous for. Oh, and its good value, too, with loads of kit for the cash and low running costs. So why arent we exactly shouting from the rooftops about this car? The sum of its parts don't quite add up, and most of thats down to the way it drives. This is Lexuss attempt to get sporty. Actually, its at pains to avoid the word sporty, referring to the car as dynamic. In Lexuss attempt to go chasing the BMW 1 Series, it has produced a car that handles well, but lumbers you with a ride that feels like its going to shake your hair loose. The car grips well enough, too, and stays flat through bends, but the steering gives you about as much pleasure as processed cheese. While were at it, good though the hybrid system is for economy and emissions, its hardly exciting as a 0-62mph time the wrong side of 10 seconds proves. The whiney stepless auto gearbox becomes tiresome, too. Lexus says it has time before the car goes on sale in the UK to address some of the issues, notably the ride. It needs to. Its all something of a shame, because there are things this Lexus does so well. The cabin is generally quiet, but for a bit of tyre noise. It looks good inside, too, and feels well made. The kit list is long, with top spec cars getting climate control, leather, LED headlights, a sensational Mark Levinson stereo and sat-nav (although the latter is controlled through Lexuss infuriating Remote Touch controller). Theres not much space in the back, but its no worse than a 1 Series or A3. The boot is tiny, though. Tiny also applies to emissions (not only CO2, but harmful local pollutants - much lower than any diesel car) and your tax bill if its a company car youll make big savings over similarly-priced 1 Series and A3 diesel autos. Road tax is free and you wont be congestion charged. If you expect this Lexus to be as cosseting to your general wellbeing as your bank balance, youll be sorely disappointed. The CT200h isnt the downsizers dream we were expecting.